When it comes to enticing a traveller, no one does it better than Bali! Lose your heart to this beautiful island as you laze around the pristine beaches, admire sunsets from Tannah Lot, and interact with the sweetest people on the planet. Full day Kintamani tour, first visit well known village of talented gold and silversmiths. Mas, a center of wood carving and painting village to view the traditional and modern art of Bali. 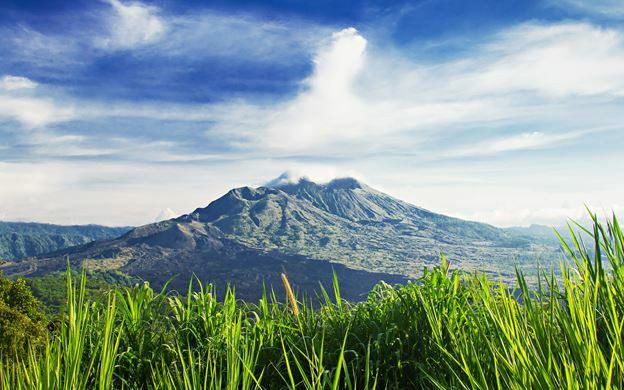 The highlight of trip is the breathtaking view from Kintamani of the smoking Mount Batur crater and its sister Batur Lake with surrounding scenery of green hills. Pick up at the airport & transfer to hotel. After breakfast, Full day KINTAMANI VOLCANO Tour, visit silver smith at CELUK village, visit painting & wood carving at MAS village. The Highlight is to see nice view of MOUNT Batur & LAKE Batur + Indonesian Buffet LUNCH will be served at the local restaurant, on the way back to visit Holy Spring Water temple and spectacular rice terraces. Shopping places are available on this tour and You may spend your time for shopping of any kind of Balinese handicraft products good for souvenir and or for collection. Evening : Indian Food set Dinner will be served at INDIAN Restaurant. After breakfast, Morning or Afternoon : 2 hours package of Aromatherapy SPA Treatment, includes : foot bath, body massage, gentle moisturizing rub, flower bath, spa ginger drink, & hotel return transfer will be provided by Spa Company. CHILD is no Spa Treatment included. After breakfast, Free arrangement and departure transfer to Airport. * Minimum Stay is 3 nights during low season. * Minimum stay is 4 nights during peak season, between 26 Dec till 2 JAN & Some other 5 star hotels apply minimum 5 Nights stay. * It is Compulsory to take any of one package of LAND ARRANGEMENT stated above. Otherwise bank fee in our recipient side will be charged to your side. * Clients must overstay on 31 Dec, No check in and no check out on 31 DEC.
* It is Compulsory to take New Year Eve Gala Dinner who stay over 31 DEC.
* No Land Arrangement Package booking only permitted, Otherwise package price is increasing to cover the bank fee. * No Accommodation booking only permitted, Otherwise additional charge of US$ 25.00 for the bank transfer fee applied while INVOICING. * Any Bank charge incurred during the payment transfer will be paid by your side / by the payee. No sharing charge fee applied. * Payment can be made by CREDIT CARD of VISA, MASTER, JCB cards (FASPAY ONLINE SYSTEM) for maximum USD 1100.00, otherwise 2,6% will be charged after the limit. * These Hotel rates are valid for FIT only and not valid for Group, Conference / Convention purposes. * Full Not Refundable prepayment for the Accommodation charge during High and peak Season applied and or according to the payment and cancellation policy applied by hotel even during low season. * Full Details booking required : name of guests, total pax, period of stay, Flight details, hotel name, type of rooms and type of beds. * Full Payment should be made prior to release date of booking set by hotel. Auto release will be made if there is no any payment in due date. * EXOTIC BALI Destination reserves the right to make any changes to the rates / prices set out at any time due to any changes in, or imposition of Government charges, taxes or levies. * Other specific terms and conditions of booking payment, amendment, cancellation, no show will be more clarified on every booking confirmation via email. * Early check-in and late checkout is subject to availability of rooms at the time of check-in and the same is not guaranteed, you may be charged for guaranteed early check-in and late checkout. * Any request of King size bed or Twin bed, rooms are near to each other in case of 2 or more rooms booking in the same hotel is subject to hotel availability. 10% of package cost as service charge for more than 25 days noticed cancellation..
25% of package cost as Cancellation charge for 14 days noticed cancellation..
50 % of package cost as cancellation charge for 7 days noticed cancellation..
Pay 4576 now to book this package. Taxes Additional.